and is a novel idea for parties too! With the new Bon-fire kitchen you can cook food in an exciting way. At home on the terrace, on the beach, on picnics - anywhere! It is nice & easy, and Bon-fire lets you cook and fry at the same time. Put the steaks on the grill while the fresh potatoes boil in the enameled pot. Or fry the sausages on the barbecue pan while the children make small twisted breads on sticks. And finish off the evening by boiling the water for a nice cup of coffee or tea while watching the sun set. All in one The Bon-fire consists of the tri-pod which is easy to unfold and put over the fire, a large grid and support chains. We also sell a wide range of high-quality accessories. All parts are easy to clean and carry around. Great savings on accessories if purchased with a 3-Leg Stand - click on a tripod below for more details! There are many different kinds of fires. We have pictured a pagoda fire - because it burns easily and is perfect for cooking. Our recommendation: · Find two logs, approx. diameter should be 10 - 15 cm, length 30 cm. Lay them down in parallel with some space between them, in the wind direction. Find two more logs, slightly thinner than the first, and put them across the other two. Add a third pair of logs as shown, so the fire looks like like a small house/pagoda (see drawing). Make some small balls of creased newspaper and put them into the pagoda. Stick short twigs all around the newspaper balls. Light the fire with a match from the wind direction to allow the flames to be sucked into the fire. Find some more short twigs and put plenty of them into the fire. Add thicker twigs into the fire, building up to firewood, remembering to lay them down crosswise to help feed air to the fire. If you wish to cook food over the fire, we recommend you put lots of firewood on from the start - this way you will have a good bed of hot coals for when you are ready to barbecue. Remember to keep feeding the fire with wood. Now it is time for you to relax! 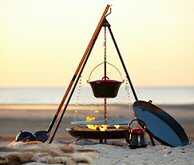 Bon-fire is a Danish company, specialising in high-quality outdoor cooking equipment. 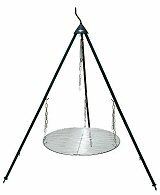 The quality of the Bon-fire camp fire equipment is very good indeed and is built to last, making it ideal not only of home use, but also for club and commercial cooking envirnoments.